Britain’s Got Talent 2013 reject DJ Scott Whitley has apparently attempted to take his own life. According to tomorrow’s Mirror front page, the DJ took 30 pills to “end it all” after begin booted off the show. 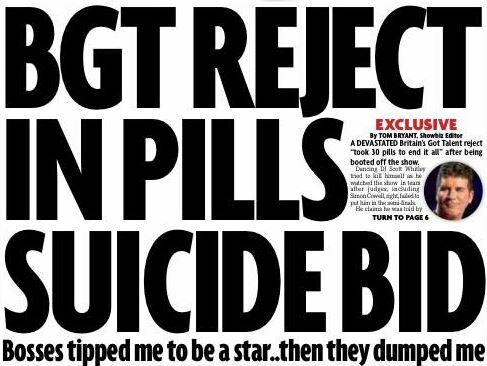 “A devastated Britain’s Got Talent reject “took 30 pills to end it all” after begin booted off the show. The 29-year-old, introduced as a fitness instructor on his audition, which aired on 4th May, wowed the judges and audience with his wacky ‘Funkacise’ routine, but failed to make it through to this week’s semi-finals. The fifth and final semi-final takes place tomorrow at 7pm on ITV.